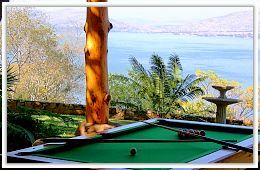 The Hartbeespoort Dam Lodge is a beautiful and unique getaway haven for those in search of peace and tranquility. Situated in the safe and secure village of Kosmos, with the most outstanding views, not only over the Hartbeespoort Dam but also the Magaliesberg Mountain Range. The calmness of nature overwhelms you when you sit and listen to the call of the fish eagle or the baboons barking in the mountains. We are only a 45 minute drive from most of Gauteng with its hustle and bustle. If you stay with us for a business visit to the area, we are in easy reach of the town of Brits with all the motor and mining industry, Sun City and Pilanesberg game reserve are less than one hours drive away. Imagine sitting at the breakfast table using all your senses, looking at the view, listening to nature, tasting the delicious cooked breakfast, feeling totally refreshed after a wonderful nights rest. We try to make your stay here as peaceful as possible and for that reason we unfortunatly do not cater for children or pets; this is the weekend when you leave the kids with granny or friends and have a romantic time. 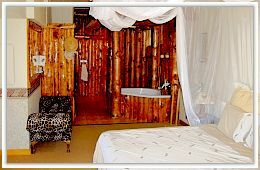 There are six beautiful luxury en-suite rooms, of which four have jacuzzi / spa baths in the bedrooms. The other two beautiful suites have showers only. All suites have TVs also tea and coffee facilities. There are four separate braai areas in the garden, a rock swimming pool and 6 seater jacuzzi you are treated to stunning views over the dam. Dinner can be served on request. For the romantic weekend breakaway, why not order a picnic basket and enjoy it in the comfort of your suite.